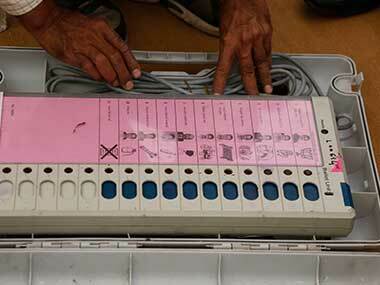 Bhopal: A Congress delegation on Sunday registered a complaint with Madhya Pradesh Election Commission, expressing concern over the security of strong rooms across the state where the Electronic Voting Machines are kept. Madhya Pradesh went to polls on 28 November. Counting of votes will take place on 11 December. On 7 December, the Madhya Pradesh High Court had dismissed a plea filed by the Congress alleging EVMs malfunctioning. The court had refused to interfere in the matter, expressing satisfaction with the action by the Election Commission of India (ECI). The court reserved its decision on the plea over the counting of Voter Verifiable Paper Audit Trail (VVPAT) slips along with EVMs. On 4 December, a Congress party delegation led by senior leaders Kamal Nath and Kapil Sibal visited the ECI and highlighted the issue of alleged faults in EVMs, particularly in Madhya Pradesh and Chhattisgarh. The delegation demanded that EVMs be protected in a secure place and counting be done in an impartial and fair manner. The counting of votes for Assembly elections in Madhya Pradesh, Chhattisgarh, Rajasthan, Telangana and Mizoram, is scheduled to be held on 11 December.